Read about the available courses OnDemand. Even in the most turbulent times, there are four roles leaders play that are highly predictive of success. 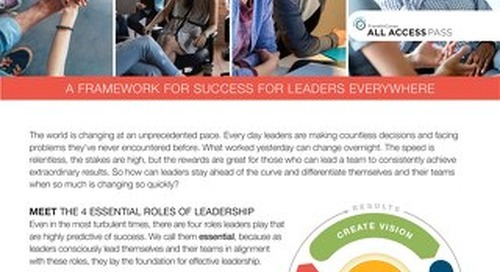 Learn how you can engage with FranklinCovey in this solution overview. 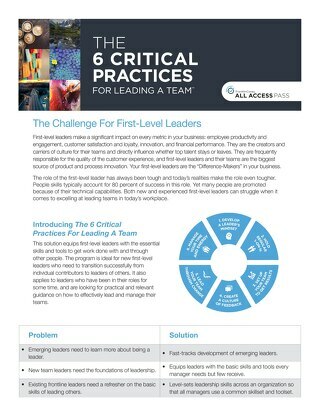 The 6 Critical Practices for Leading a Team equips first-level leaders with the essential skills and tools to get work done with and through other people. 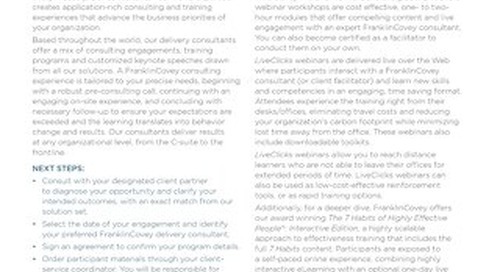 The overwhelming majority of customer service training focuses on skills - here’s what you do. But at FranklinCovey, we know that you must first focus on your beliefs and paradigms. Change frontline behavior. Delight every customer. Drive faster growth. Employees must feel like valued members of a winning team pursuing an important mission. It takes a leader to inspire and lead them to accomplish this. One Day Course Outline - Read and download. Qualifying Opportunities helps sales professionals quickly and effectively identify good opportunities in their pipelines and significantly decrease ‘pipeline fiction’ by eliminating the weak ones. With the right advocacy skills, you demonstrate more effectively how your solution will help your client get what they want and need. When it comes to building sales culture, leaders are the fulcrum change.